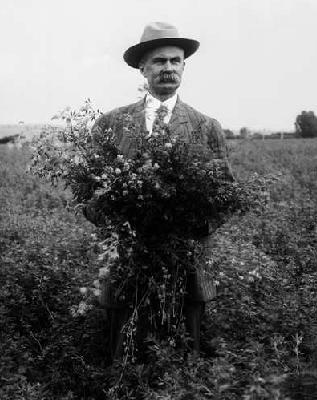 Photo courtesy of early pioneer with a sample of alfalfa copyright by Denver Public Library. "Humans aren't the only species on Earth, they just act like it"
Prior to the agricultural revolution (about 10,000 years ago), humans had lived off the land for perhaps hundreds of millennia. Survival depended on knowledge of local ecosystems for hunting, food gathering, medical assistance and shelter. The passage of time was measured by natural seasonal cycles; the rhythm of life was the rhythm of the seasons. We were an integral and integrated part of the global ecosystem. With the invention of agriculture and accompanying technological innovations, villages and finally cities developed, artisans appeared, and social structures and communications became more elaborate. Exploitation of natural resources for enrichment of the human enterprise became a part of the more urbanized cultures. There seemed to be no limits to those resources. The creative human mind and the advent of commerce found increasingly more sophisticated ways to obtain the resources and to use them. Thus, today, although we are still integral parts of the system, we are less integrated. We are somewhat analogous to the exotic species that disrupts the ecosystems into which it is introduced. One of the tragic and unintended consequences of the exponential increase (Part III) in urbanization, particularly in the past century, has been the increasing isolation of human beings from the natural rhythms and conditions that both nurture and constrain them. This is especially true in the so-called developed world where, aided by the ease and rapidity of transport of goods, our city markets have fresh vegetables, fruits, milk and meat more or less continuously available. There is very little understanding among consumers of the unique combinations of soil, water, weather and climate that determine the seasons of harvest for the fruits and vegetables we enjoy directly, or of the processes which make it possible to bring meat and milk to our tables. There seems to be even less understanding of the complex interaction among elements of the lithosphere, hydrosphere, and atmosphere that sustain populations of fish in our oceans and lakes. Many of us are far removed from our heritage as peoples of the land. As a consequence, we are dependent on specialized technology, skilled artisans, global commerce, and large-scale exploitation of the commons (Part I ) for food, shelter, and clothing. Most of us have lost the personal knowledge needed to do even simple farming. That loss may come back to haunt us because large cities are the most vulnerable human habitats in a sustainable future. We, or our families, may have to learn again how to plant, nurture, harvest and hunt. We may have to re-learn how to live with the seasons and in balance with our surroundings. The geological sciences have taught us that we live in a universe of change. This lesson is embodied in a beautiful paraphrase of a verse from the Qur'an (Sura 27; Aya 88), "In the presence of eternity, the mountains are as transient as the clouds". Geologic studies of the environmental record since the last deglaciation (about 13,000 years ago) show that this change includes global ecosystems (e.g. Ruddiman and Wright, 1987). Nature is quite dynamic and interactive. We need to understand that the complex of systems that makes up our present-day environment has never been steady-state. Increasingly sophisticated biological studies demonstrate that all organisms share some common elements, if only at the genetic level. Although we humans seem to feel and act as if we are distinct from all other organisms in the web of life, this is not really the case. If we look back in geologic time ( Part II), our self-determined uniqueness within the web blurs. This blur involves not only our biological relations to other organisms, but also the cultural development of our human species. We are truly a fundamental part of the global ecosystem. The western cultural attitude that nature is to be "tamed" and that the environment is somehow an adversary is one of the roots of our conflicted response to the issue of sustainability (Berry, 1999). Once we come to terms with the imbalance we have created in the global ecosystem by failing to remember that our context is WITHIN that ecosystem, we can face the challenges of sustainability creatively. Berry, Thomas, 1999, The Great Work: our way into the future: New York, Bell Tower, 242 p.
Ruddiman, W. F. and Wright, H. E., Jr., eds., 1987, North America and adjacent oceans during the last deglaciation: Boulder, Colorado, Geological Society of America, The Geology of North America, v. K-3, 501 p.
DEMONSTRATION 1. - Ask your class to discuss what knowledge they might need if they had to become personally responsible for their food, clothing and shelter and live in the countryside. If your community is already rural, ask the students what foods and other material goods they feel are essential to their lifestyle. How many of these can be obtained locally? DEMONSTRATION 2. - Have the students determine the optimum size for a sustainable city in the region where you live, in terms of a variety of variables such as the true cost of energy required for transportation of goods and services, the distance between producers of food and clothing and the consumers, and the number of people required to provide for the basic needs of a single individual resident of the city.. DEMONSTRATION 3. - How has the natural landscape in your vicinity been modified by human activity? How has this helped or hindered your possibilities for a sustainable future? What actions can you take locally to ensure such a future?